Strangely, cooking always stirs me up a great deal. I can’t really understand how and why, but the thrill it gives me is reason enough to put these questions at bay. So today, after enough of fretting and feeling jobless, I decided to make something. Or, rather, BAKE something. And within minutes of writing the previous blog, I had started my research. I found a recipe online for a different type of chocolate cake -‘Molten Chocolate’, it was called - and decided, on the basis of the easy availability of its ingredients, that I would try it out. If you have the ingredients in place, it shouldn’t take you more than 45 minutes to an hour. 1) First separate the eggs – yolk from white. 2) Mix 1/3 cup of the sugar with the yolk. Preferably, beat it in a mixer. 3) Add the vanilla essence to the sugar-yolk mixture, then beat it again. 4) Take the egg white and whip it gently till it becomes frothy. Then add the vinegar to it and whip it up again. 5) Heat the chocolate and the unsalted butter together till they melt, then mix them well. 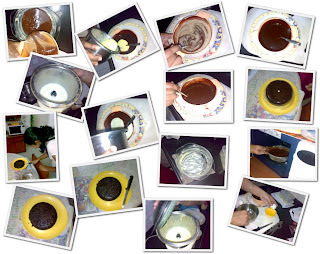 6) Add the sugar-yolk-vanilla essence mixture to the chocolate-butter mixture. 7) Add the egg white – vinegar mixture to the above mixture. 8) Take small moulds (to make small pies) or a big dish (for one big cake) and butter the rim and bottom. 9) Sprinkle the remaining sugar on the sides and bottom of the buttered moulds / dish. 10) Pour the molten mixture into the dish, and place it in the microwave for about 10 minutes. 11) The sides will swell up and become crusty, while the centre remains soft. 12) Test with a knife to ensure the cake isn’t sticking to it. If it isn’t, your cake is ready!! Yay! 13) You can top it up with whipped cream or vanilla ice cream. But it tastes great even minus the toppings. Mine turned out to be slightly different from the picture, (it turned out to be a really soft cake instead of one with a molten centre) probably because I used a microwave and not an oven. But it still tasted really nice. Personally, I think if you are making one single cake instead of many small pies, slicing it will be really difficult if the inside is gooey. So, this is how I turned an ‘almost-wasted’ day into a really happening, productive one. Wonder what I’ll try the next time I’m bored and lazy!! well it tasted even lovelier!!! goood job! when do we get to taste it!